REMEMBER: FREE Shipping on ALL orders (No minimum order amount required)! 5% off all orders! – Use code MOM5 at checkout. Expires May 9. 10% off all orders of Oniss and Mondaine Watches – Use code MOM10 at checkout. Expires May 6. 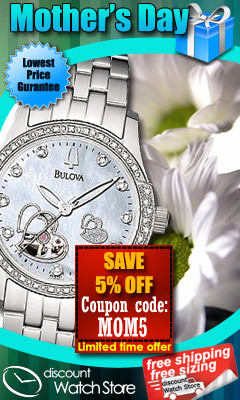 12% off all orders of Citizen and Bulova Watches – Use code MOM12 at checkout. Expires May 6. 15% off all orders of Glam Rock Watches – Use code MOM15 at checkout. Expires May 6.